The Gigabyte Aero 15 is one of the thinnest and most powerful 15-inch laptops around, and now it’s getting another uptick in performance with a Max-Q upgrade. The Taiwanese electronics firm has released a new Aero 15 X model featuring an Nvidia GTX 1070 graphics chip in the component maker's newer and thinner Max-Q design. This is Gigabyte’s second Max-Q gaming laptop, after the GTX 1080-equipped Aorus X5 MD, and Gigabyte claims the higher-end GPU should yield about 40% better graphics performance than the original model. This Nvidia GTX 1070 upgrade also puts the hybrid professional-gaming laptop on equal footing with the MSI GS63 VR Stealth Pro and well above even the most well-equipped Dell XPS 15. 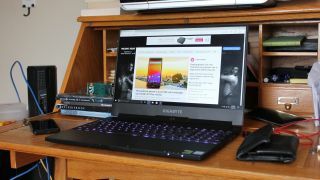 That said, if you’re looking for the most graphical performance from a 15-inch gaming laptop, you should look to the Asus ROG Zephyrus GX501 and Acer Predator Triton 700 – both Max-Q systems. Aside from the new Max-Q graphics chip, the Aero 15 X is identical to its Nvidia GTX 1060-powered predecessor. Both machines feature 7th generation Intel Core i7-7700HQ processors, 16GB of DDR4 RAM and a 512GB SSD all wrapped up in the same chassis. We honestly would have appreciated a bump in screen resolution above Full HD, but at least users will still get an X-Rite, Pantone-certificated panel for true color reproduction.